The snow appeared powdery, but a graveyard of god’s discarded granite littered the subsurface, lurking like the naval mines of the past, intermittently catching my skags, ripping my bars from my hands. Just in front of me, I watch the blur of Chris Burand’t green Polaris dart through the trees, following the ice-luge trail. The pre-ride anxiety had nearly faded as the trail crested to the first vista. All I could do is gaze, being surrounded by some of the most recognizable mountains in Wyoming and some of the best riders in the West. But, then sound of a crisp turbo, followed by the soothing whisper of blow-off brought me back to reality, yet still, I was in a dream. This year, as with ever Thanksgiving, I drove to my hometown of Scobey, Montana, a small agricultural community in Northeast Montana. I relish time with my family, most of whom I only get to visit once or twice per year. However, as storm after storm pounded Colorado, I’ll admit, there was a part of me that was ready to return home and begin the season. I was out with my cousins, hunting coyotes and rabbits. My phone had been quiet for most of the week, an oddity anymore. In fact, I don’t think I had received a single snowmobile text in several days. All at once, my phone turned into a Vegas slot machine and I had hit the jackpot. Texts were coming in so quickly, the ringer on my phone was unable to keep up. The ‘Storm of the Century’ was fixing to slam into Colorado, and I was stranded on an ‘island’, seven-hundred miles away. While attending the first white-room session was not possible, and ended up not materializing because of a shift in weather, my season had officially started, at least in my brain. I couldn’t stop thinking about it. My sled was in Idaho Falls, at Boondocker, getting its turbo installed. I hadn’t even ordered any parts or gear. I hadn’t accomplished anything on my pre-season chore list, except buying camera gear. My mind was now racing. How could I start riding already? The problem was compounded further, only a few hours later, when Kris from Boondocker called and said my turbo was ready. 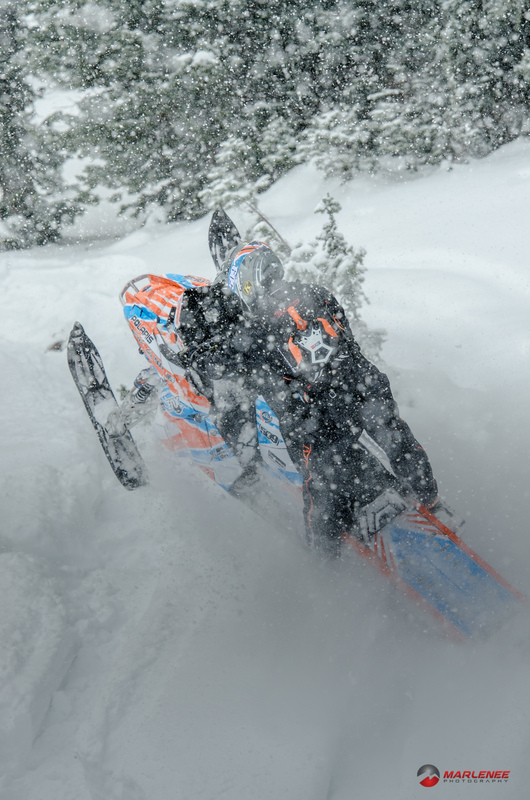 I had logged a short ride on the AXYS chassis last spring, and was almost excited for the new sled as I was the season. Add to that, the new technology and options from Boondocker, including a new turbo choice, that had been capturing my eye throughout expo season. Furthering my angst, I now had to figure out how to pick my sled up, another 600 miles from my house in Windsor, CO. So, I did what every stressed out person does these days, and opened up Facebook. 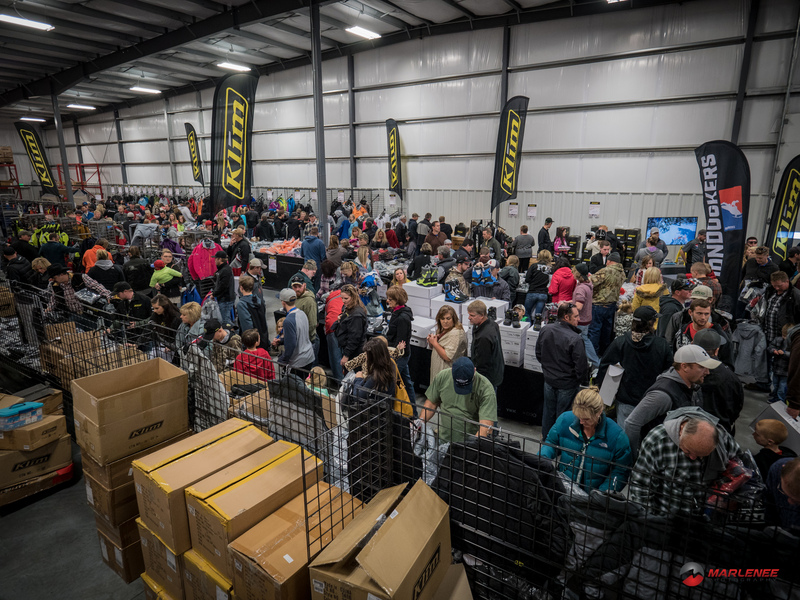 The first ten news flashes were folks sharing the press release on the Klim open house, only a week away. Starting to put the pieces together, I starting trying to problem solve. How could I get my sled? Should I attend the Open House? How could I get from Scobey, MT to Fort Collins, CO, and over to Idaho Falls, ID? On top of it all, I had a project to do with Boondocker. I had to go to Idaho, I just had to. Leaving Scobey, I had made my choice and the plan was set. I called my contact at Klim and told him that I would be attending. I also called Boondockers back, and let them know I was basically en route. It was not Sunday night; five days to go. I had to make a detour of a couple of days in Gillette, WY to do some work, but that stop was on my way to Fort Collins. Tuesday evening, after finishing a few meetings, my family and I hit the road for Fort Collins. The anticipation was running through my blood like high-pressure hydraulic fluid. On this leg of the tour, I called Adam Onasch. Adam is always someone I can count on for a last minute trip. Adam was hesitant. 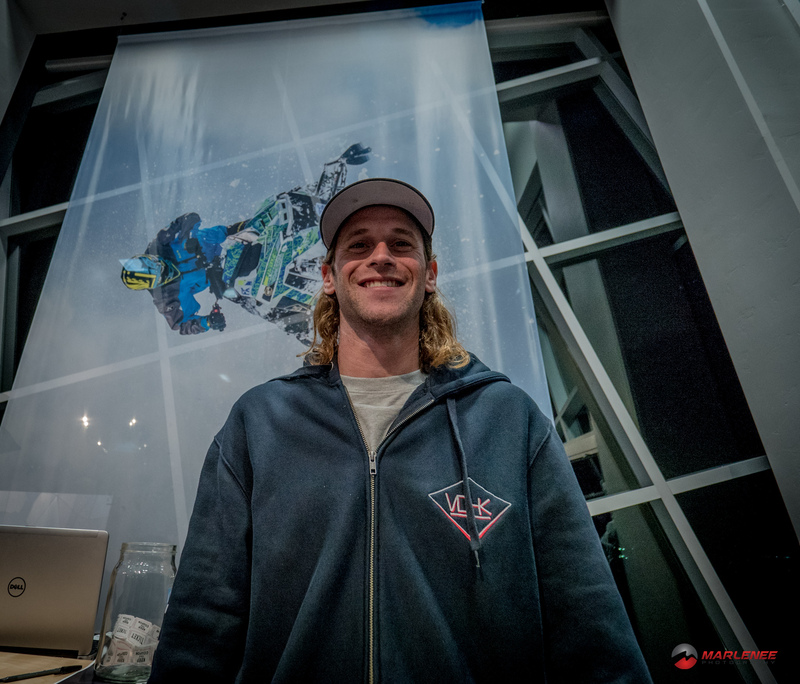 He didn’t want to miss out on any rides, but welcomed the opportunity to visit Klim, tour the offices, meet all of the team at Boondockers, and for the opportunity to possibly ride in Idaho. Adam needed to sleep on it before he decided. We arrived at my home around midnight on Tuesday night. I awoke Wednesday morning, like a child on Christmas morning. I raced down to my computer, no later than 5:00 AM, trying to cram in as much work as possible. I also had to pack all of my film and photo gear, my sled gear, and needed to refresh my suitcase. Adam called me around noon. 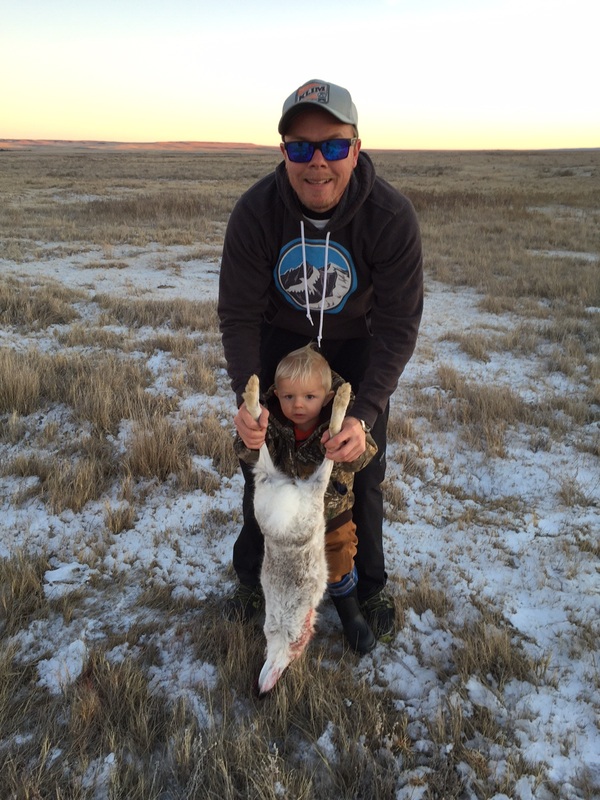 He was in, and decided that the best route for him, was to meet me in Wamsutter, WY, about three hours from my house, but a shorter trip home for him. I left my house around 4:30 PM, and promptly met Adam around 7:30. Our drive, from Wamsutter, WY to Idaho Falls went quickly. The first leg of the drive, to Rock Springs, was filled with excitement. Adam filled me in on each of the rides he’d taken this year, totaling over 500 miles. He had never been to either the Boondocker or the Klim factory. Although Adam would never say, I could tell that he was more excited than I was. From Rock Springs to Idaho Falls was a different story. I kept talking in an effort to stay awake, but Adam was intermittently dozing off at me, answering only with a barely-conscious “yeah”. We checked into the Fairfield Inn around 1:00 AM. I was beat. I don’t even think I took my clothes off, and I needed to be at Boondockers by 8:00 AM. Luckily, the hotel was close. We showed up at Boondockers, maybe just a few minutes late. The entire crew sat down with Adam and I, and we worked out a plan for this project. Adam sat back and took it all in. Being stranded without a car, he made the most of the situation and offered up his help, which I appreciated very much. We finished filming around 6:00 PM, and packed everything up. Adam had wandered back into the shop and was talking with Jared Sessions. When I went to find him, I discovered that Keith Curtis had stopped by and was gossiping with a group of three of four guys. The scene reminded me of morning coffee in my hometown with the old farmers and ranchers. Topics included, of course, the weather, the outlook for the season, and plans, while Jared was in the background, fabbing up some parts. The phone rang, and Jared took the call. Sid Huntsman was installing a new BD turbo at his house and was having some difficulties getting a bolt out. Jared was swamped at the shop, so I volunteered Adam and I to run out to Sid’s house to help, mostly I volunteered Adam. Jared gave us an impact screwdriver and sent us on the way. 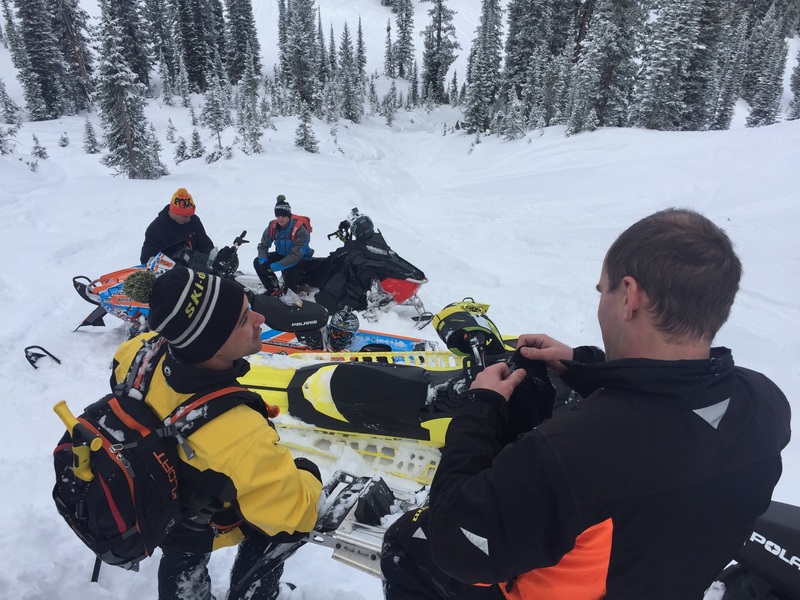 When we arrived at Sid’s house, just 20 minutes or so from Boondocker, Sid and Tristin had Sid’s sled nearly put back together. The problem bolt, was in fact, not part of the turbo installation, but the TKI belt drive. This specific bolt required some heat to remove, and Adam immediately knew the problem. Adam took control of the removal, and applied the proper heat, as well as solving the problem of the partially stripped head. Within an hour or so, the bolt had been removed, and the TKI drive was installed and functional. Sid pulled up a few chairs, and again, we sat and talked, this time for a few hours. Again, on Friday morning, we headed to Boondocker to finish filming. Around noon, we loaded everything up and headed for the open house at Klim. Boondocker wished to use my sled for their display at Klim, to which I immediately obliged. We helped move sleds around, including Sid’s at the entrance, and Adam’s, along with Chris Burandt’s, Ross Robinson’s and a few more, lining the other side of the entrance. Sid gave us a brief tour, ending in the new lobby. This was a special treat. I had known for quite a while, that Klim had chosen one of my photos of Adam as a main piece in the lobby. As we entered the lobby, Sid and I watched, as Adam was filled with amazement and honor, as he gazed upon a 30-foot banner of him whipping his sled. For me, one of the many things I love about what I do in this industry, is getting to watch and help athletes succeed. I love seing their progression, in riding and/or in recognition. Adam is one of the best riders that I get to film. He has managed to fly mostly under the radar. However, in the last year, Adam has had a ton of great content published, and I can only hope that I’ve helped with some of it, although it’s been really easy, because he is so fluid to film. 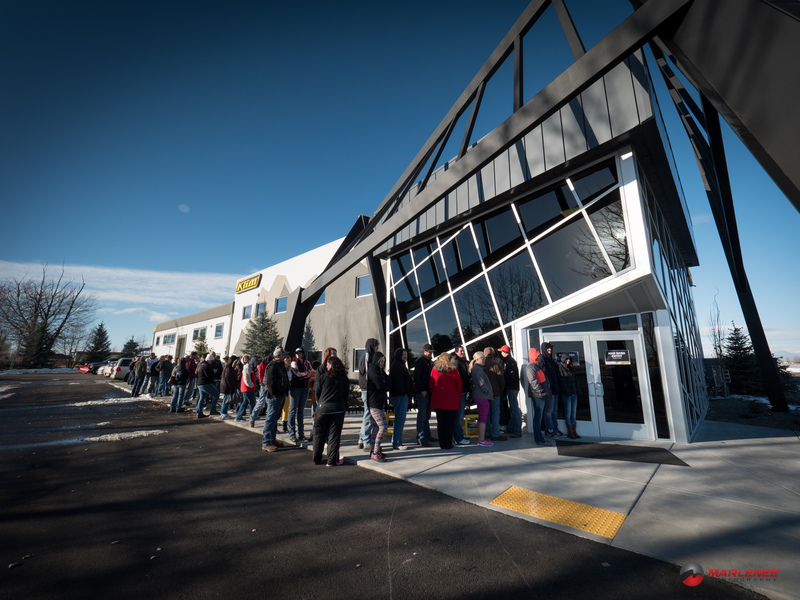 The Open House at Klim was intense. I can only explain it as a ‘polite’ Black Friday. The deals were incredible. Everything was being sold. Most of the non-current gear was blown out at what I can assume was more than 50% off. 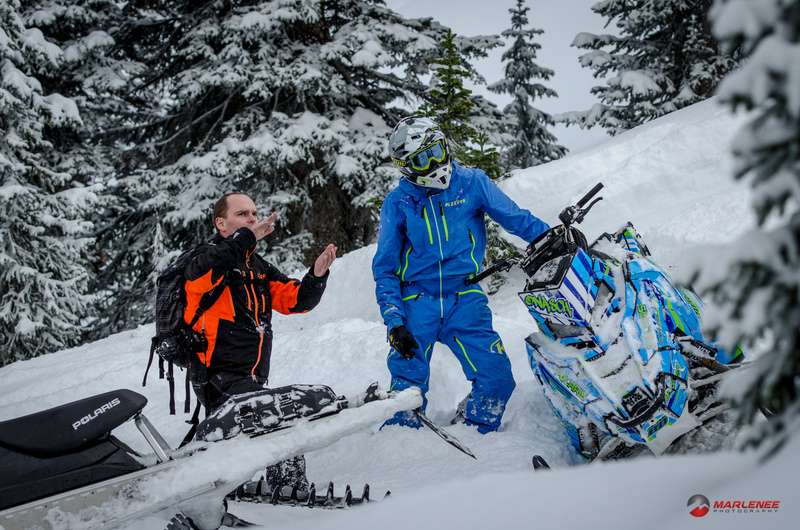 And for those of you that have waited for a Klim sale, deals like that never come around. Sample items were also being sold. It was fun to see folks getting items that no one else would ever have. And, for those that wanted the newest gear, they also had their full line on display, although the current gear wasn’t discounted. Add to that the window shopping of a few other vendors with booths, the event was a success. The line was over 100 yards long, and four abreast. It was awesome. The next day, however, was a different story. Going from a near chaotic experience for the open house due to the shear numbers of people, the structure of a solid group ride now took over. The chosen few, consisting of Klim athletes, Boondocker athletes, and a few random stragglers were all going riding. The goal was to be on the mountain by 9:00 AM. We left the hotel at 7:00. Our local caravan included Chris Burandt, Ross Robinson, Keith Curtis, Jared Sessions, Kris Eidinger, Cole Willford, Adam Onasch, Sid Huntsman, Stephen W. Clark and myself. We met up with a few more people, including Tony Jenkins at the trailhead, and headed up the mountain. This was my first ride on my new Boondocker turbo. There was more snow, at least at the parking lot, than when I was here in March with Jim Phelan and the Thunderstruck crew, and much less treacherous, as the clubs had constructed some very nice bridges to cross the creeks. Just a few miles in, folks begin to give in to the urge to leave the trail. The snow looked sufficient. However, sled-eating boulders of granite were hiding just below the recent dusting of fresh snow. Even on the trail, I could feel the razor sharp rocks grabbing at my skags, at times, ripping the bars from my grip. I knew better, but sat back and watched, secretly hoping to catch a scorpion. We continued to move towards the summit, and I was glued to the trail, purely in terror. As we crested the final pull to the summit, things got a little Western for me. I wasn’t ready for the power of my sled. The new 2016 AXYS, with the Boondocker turbo runs a lot differently than my ’15. There is so much more bottom end. With each change in direction, I was overwhelmed with the power. 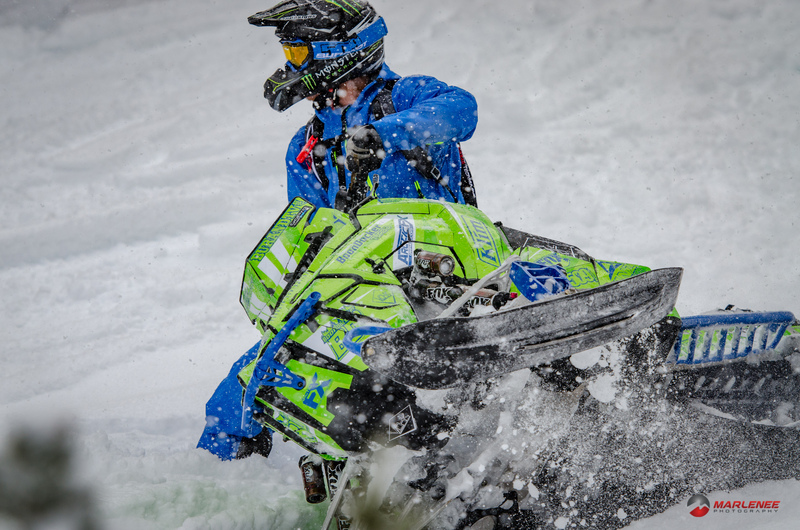 And, each time, my sled would nearly be torn from my hands, in a full turbo tail-stander. However, I managed to make it. At the top, I came upon a postcard scene. The raw beauty of scenery, with the retreating fog, by itself, would have been overwhelming. But, add to that, the dream-like experience of getting to ride with the superstars of Western Riding. I had to take a moment and let it all sink in. Since before I graduated highschool, like many sledders, I idolized people like Chris Burandt. I’ve gotten the chance to ride with him before, but I still can’t wrap my brain around the talented athletes that I get to capture via photo and film. Add to the mix, the remainder of the crowd, and it was truly an all-star day. The longer I do this photography thing, the more I feel myself getting desensitized to it, I mean, they’re all just real people, so it’s easy to do. Every person I’ve shot is a good person, despite what you hear on the forums or out of the rumor mill. Each athlete, has gone out of their way to lift me, as a photographer, up. So, I try to remind myself, on each ride, that what I get to do is pretty exceptional. I do this, in part, to keep it real. This is a job, and I have responsibilities. A little reminder helps keep the drive alive, and to spend the hours researching and planning what I’m going to do. It motivates me, because often I find that I really want to just go and ride, and leave the camera bag at home. Experience like this one help me remember why I don’t. The remainder of the ride went as planned. Chris’s new pump gas turbo ran flawlessly. I found several different moments, where the entire group sat and listened to and watched him ride. It was hard to interrupt everything to get some interview footage. It was literally like watching a live edition of 509. The exhilaration and anticipation of a ride, especially for me, is nearly as intense as the ride. I find that, on each outing with the ‘pros’, that I’m anxious. Can I keep up? Will I get the shot? What did I forget in my hotel room? Often, it’s gut-wrenching, like I’m walking in to take college-prep tests. But, in the end, it’s always worth it. 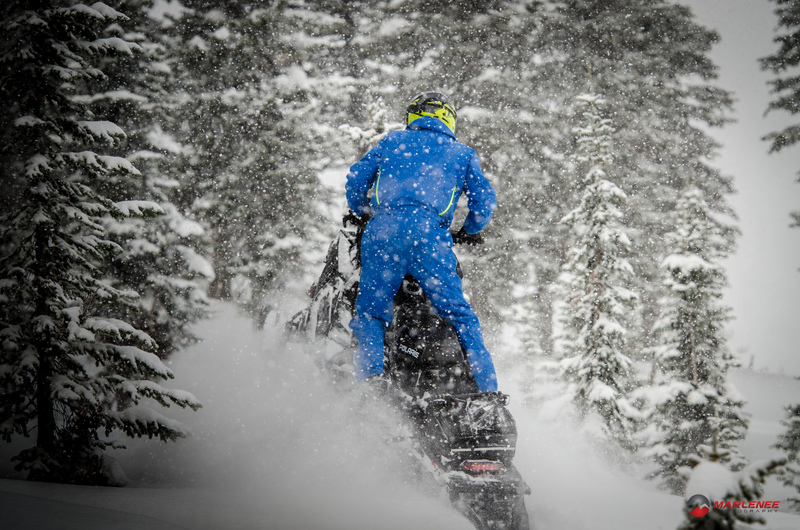 I absolutely love snowmobiling, and am always thankful for getting to be a part of such a rad industry. Nicely said Steven! Great write up!